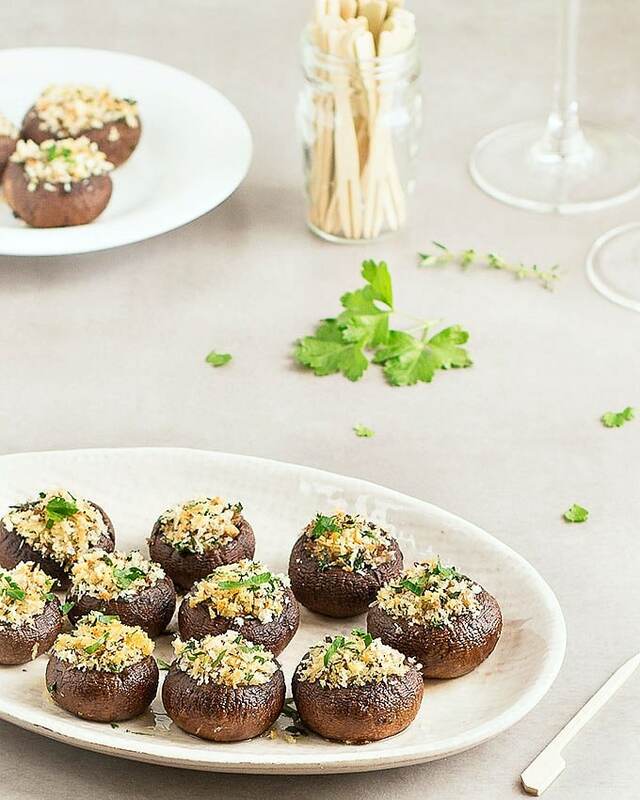 These panko stuffed mushrooms are super easy, full of flavor and the perfect appetizer to serve at any party. 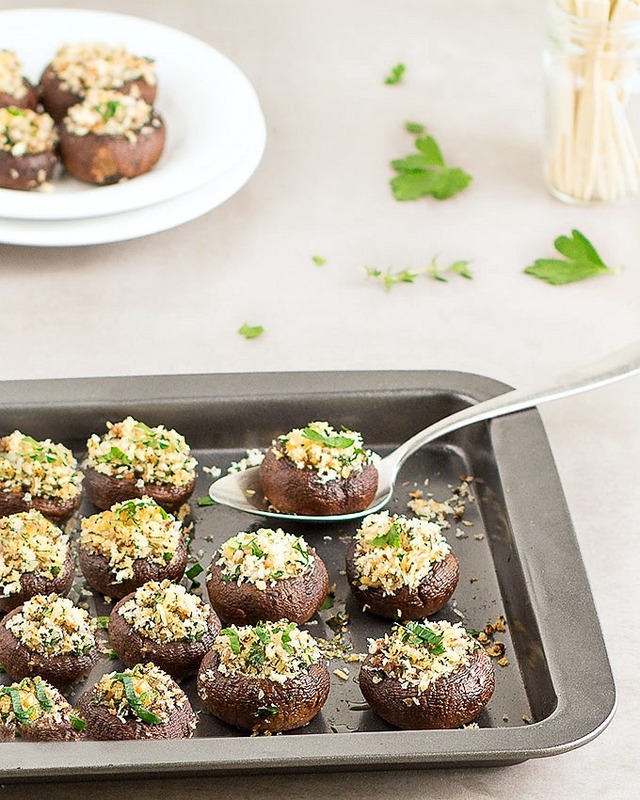 To make the stuffed mushrooms wipe the mushrooms with a damp paper towel, pull out their stems, rub them with a little olive oil and place them on a baking sheet. Cook the filling for a few minutes, fill the mushroom caps and pop them in the oven for 10 minutes. When they’re done, sprinkle some chopped parsley over the top and serve. I kept the filing pretty simple, feel free to add other herbs and/or spices. You can use white mushrooms but I like the hearty flavor of crimimi mushrooms. Make sure that you purchase mushrooms that are not slimy or bruised, firm and big enough to be filled (keep in mind that they shrink when baked). Panko stuffed mushrooms can be prepared ahead of time and refrigerated until your guests arrive, then bake them just before serving. 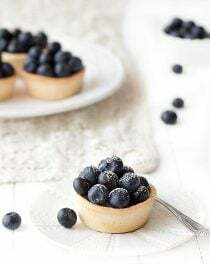 Leftovers can be saved in the fridge for up to 3 days, though they may get slightly softer after reheating. 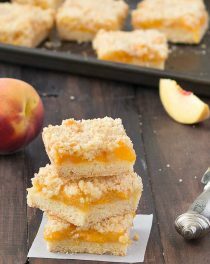 This is a recipe worthy of sharing at your next holiday party – they are sure to be a crowd pleaser! I’d love to hear what you think if you give these panko stuffed mushrooms a try! Leave a comment and don’t forget to take a picture and share it on my Facebook page or tag it #aseasyasapplepie on Instagram! Preheat oven to 180 degrees C (356 degrees F). Wipe the mushrooms with a damp paper towel, pull the stems off, then chop the stems finely. Heat 1 tablespoon of olive oil in a skillet over medium-high heat. Add the garlic and chopped mushrooms stems and saute for 2 minutes, or until soft. Add the panko breadcrumbs, salt, pepper, stir and cook for 2 minutes. Remove from heat, add the chopped herbs and toss lightly to mix. 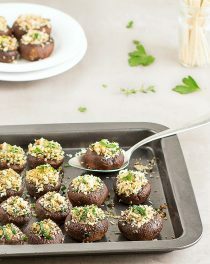 Brush the mushrooms with olive oil, place them on a baking tray then spoon about 1 teaspoon of filling into each mushroom. Drizzle with the remaining olive oil and bake until the panko stuffed mushrooms are tender but still hold their shape, approximately 10 minutes. 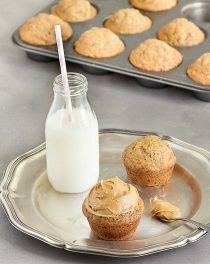 They are best served warm but still delicious at room temperature.